Where else can you ski in the morning and hit the beach in the afternoon? Just half an hour’s drive from downtown Vancouver, the slopes of the North Shore Mountains offer incredible views across the water to the wooded islands beyond. Long stretches of tree-lined shore and soft white sand made National Geographic rank this clean and easy-going city among the world’s top 10 beach towns. All teachers have a level of education normally represented by a degree and they also have a CELTA or equivalent qualification. Some also hold the higher level DELTA qualification, PGCE, or MA in applied linguistics. Language programs at designated/ interim designated institutions that are longer than six months or for which tuition is at least $4,000. A language program is defined as a program that has as its learning objective that students gain or improve proficiency in a language. Student who enroll in a language program which is six months or less in duration, or for which tuition is less than $4,000, in a single instance, may not make a claim against the Student Tuition Protection Fund, which is managed by the PTIB of the Ministry of Advanced Education, Skills and Training. Further, this language program may not have been reviewed or approved by the PTIB. This Kaplan International English school is accredited by Languages Canada and holds a Designation Certificate from the Private Training Institutions Branch. Visit the Canadian Disclosures list for the documents filed with the provincial regulating authority and/or required to be made available prior to enrollment. 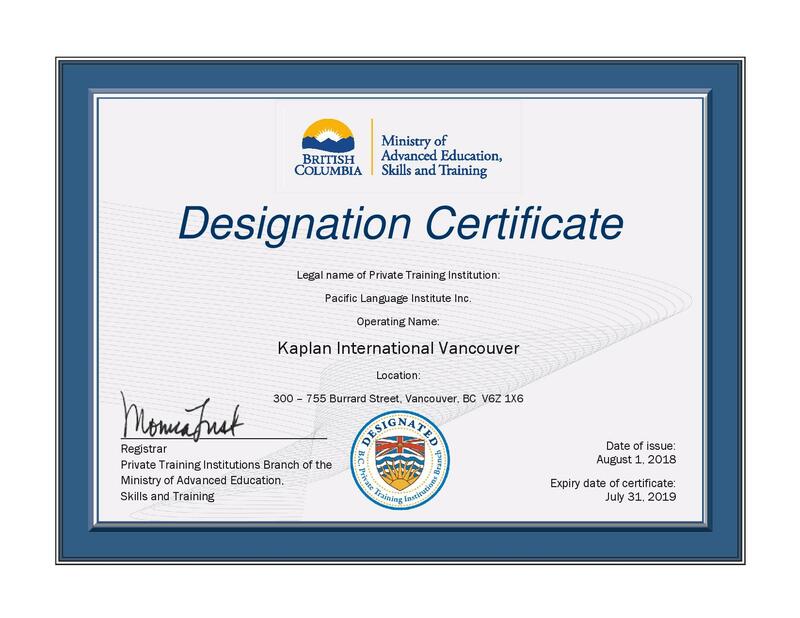 Kaplan International Vancouver holds a Designation Certificate, issued by the Private Training Institutions Branch (“the PTIB”) of the Ministry of Advanced Education, Skill and Training. You may view the Certificate here. Our Vancouver school has a dedicated social program, designed to help you explore the city and build friendships, through organised events and activities. Ideal for students who want to learn about and immerse themselves in a new culture. Sharing meals with your hosts every day, you'll benefit from speaking English in relaxed, natural situations.